The Barnabas Ireland Conference 2019 will take place from 8th to 11th August 2019. The Conference, in association with Lisnadill Full Gospel Church, is entitled ‘God’s Higher Calling’. The venue is The Lodge Hotel, Coleraine and the speakers will be Gordon and Rachel Hickson. Rachel and Gordon Hickson have been married for nearly 40 years. They have 2 grown up children and 5 grandchildren. Gordon and Rachel travel internationally – training leaders, speaking at conferences, strengthening the church. They love the diversity of different cultures. Rachel is the author of 8 books to date. They cover topics such as prayer, the prophetic gift and devotional guides. They carry a passion to see God touch the lives of people with His power and love. Rachel should have died after a terrible road accident in Africa in 1984 but was miraculously healed. So together they now love to watch treasures hidden in dark places find life and get restored. The cost for adults aged 17 and over is £10 and is free for pensioners and all children 16 years old and under. Accommodation packages are also available for the duration of the Conference at The Lodge Hotel. Click here if you need directions to the hotel. 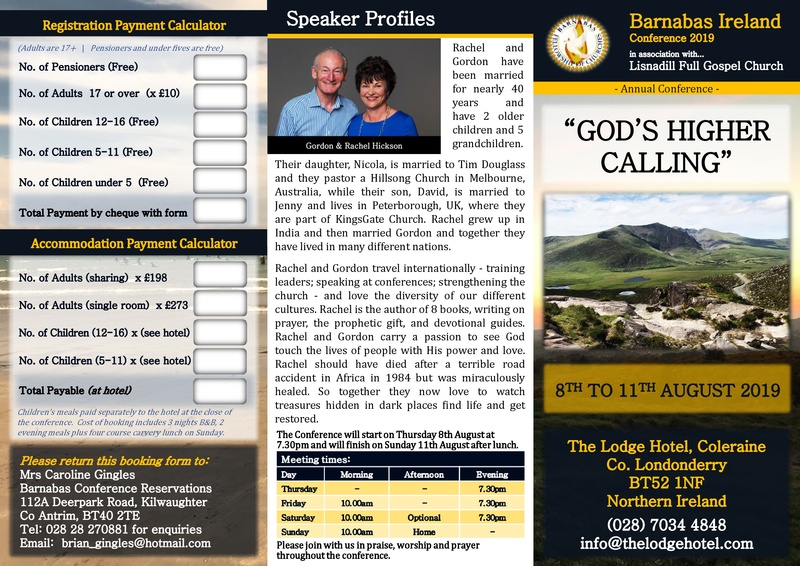 The organisers encourage you to join them for the Barnabas Ireland Conference 2019 – ‘God’s Higher Calling’.